Don’t squeal, unless it’s a big deal! Always say thankyou, don’t forget please, and always, always cover your sneeze!…. Who ever said propaganda was only useful for a war effort? It’s even better put to work on the “home front!”. 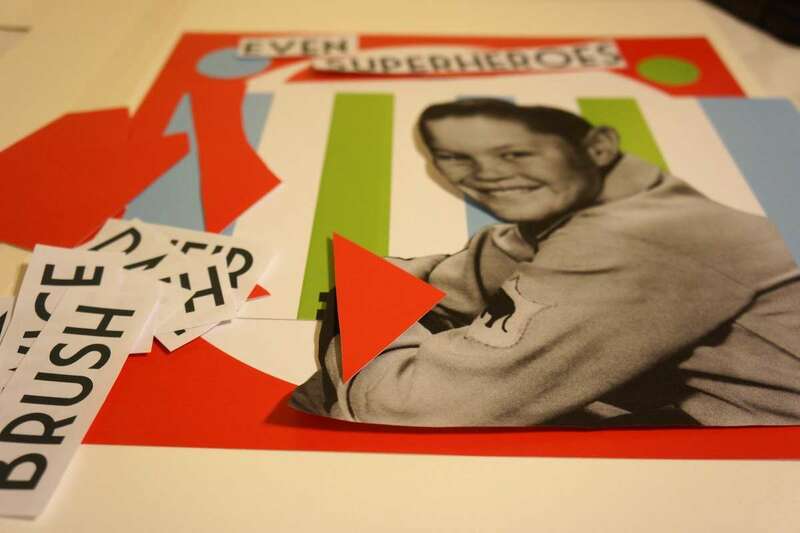 This month our kids craft item is inspired by our exhibition Persuasion: US Propaganda posters from WW2. Full of vibrant colours, retro graphics and unashamed slogans it made us feel like making a very persuasive poster of our very own. And what better place to start than selling good manners, etiquette, hygiene and all such behaviours that distinguish your little “do bees” from your “don’t bees”. 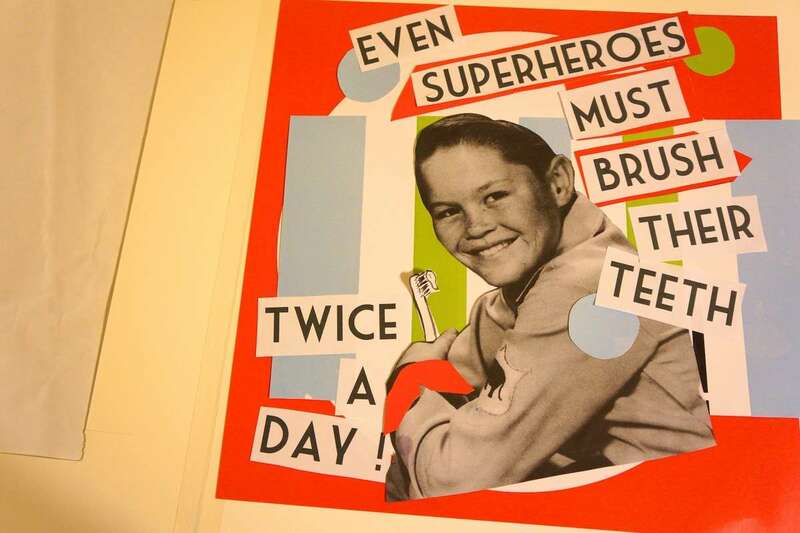 Here’s hoping a bit of poster magic can turn them into a food-eater, a bed-goer, a play-safe and a tooth-brusher! 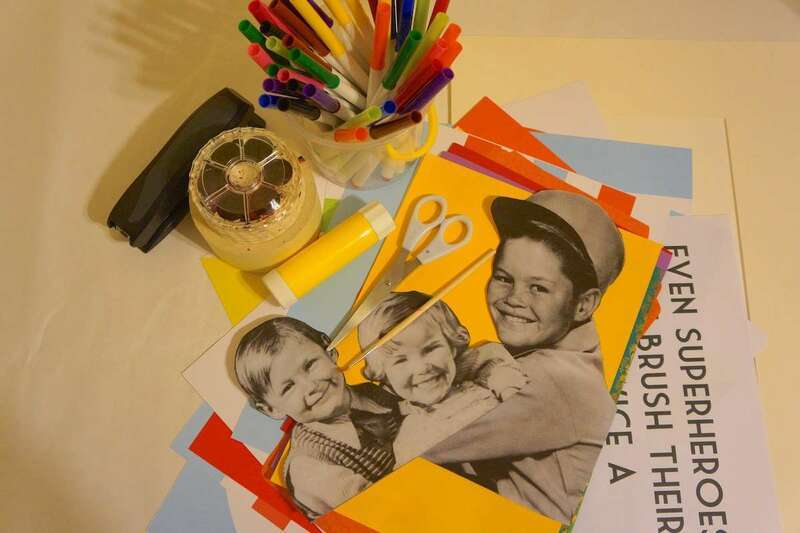 Collage is such a fun and easy activity for kids of any age to do and doesn’t require any complex materials you wouldn’t already have. 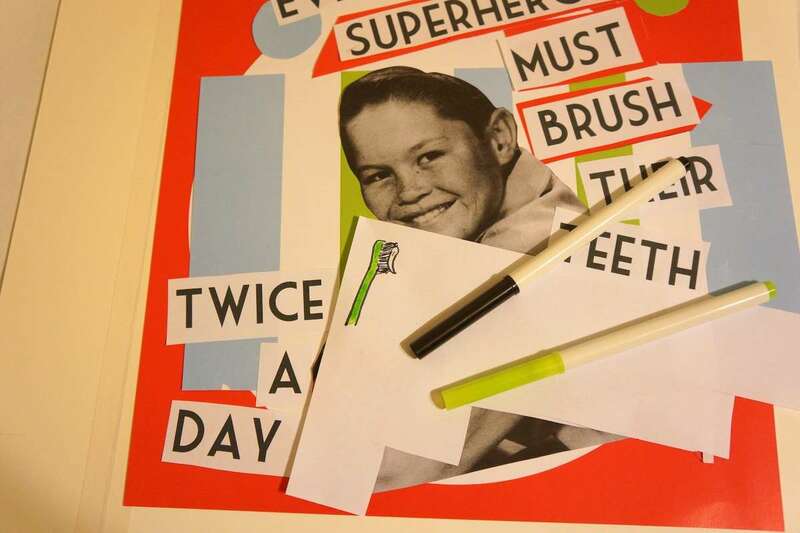 Here’s a how-to on our “brush your teeth” poster collage. Printed text caption. Or you can use ours here. 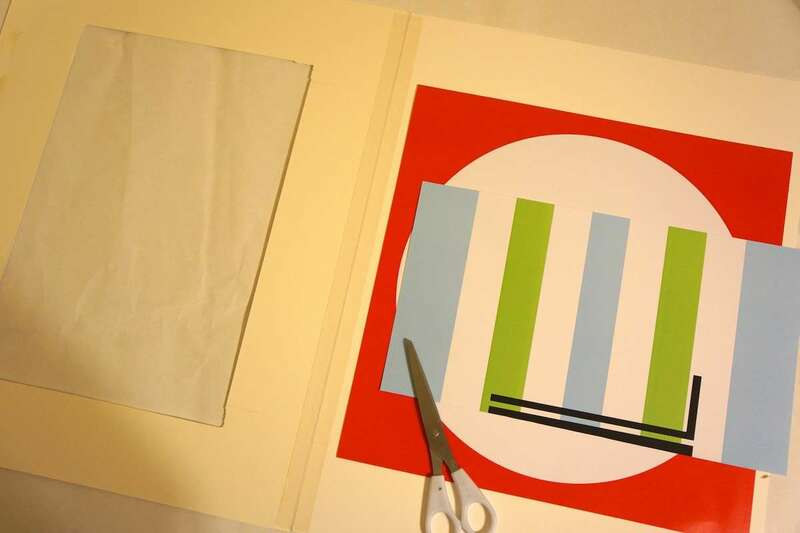 Cut out some bold graphic shapes from your coloured paper. Cut out your words and your photograph. 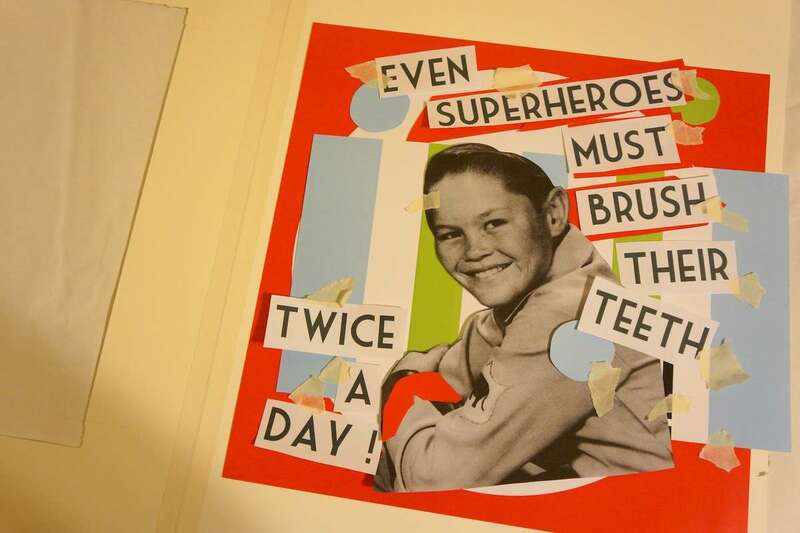 The key to a good collage is all about balance. 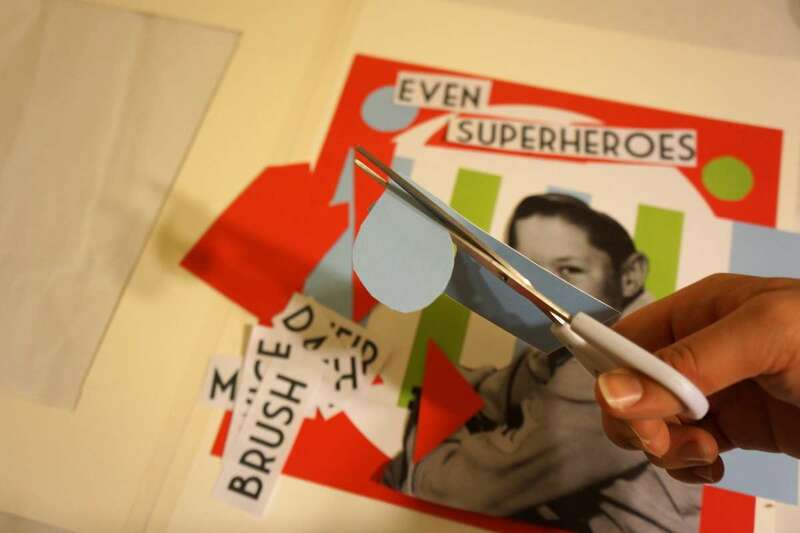 For kids it’s often all about skipping straight to the glue, so if you have something particular in mind you might want to prepare the layout for them. Try and arrange the main elements on triangular/ diagonal vectors to carry your eye across the page. Once you have some background patterns and floating shapes, layout your text caption and main figure onto your poster. 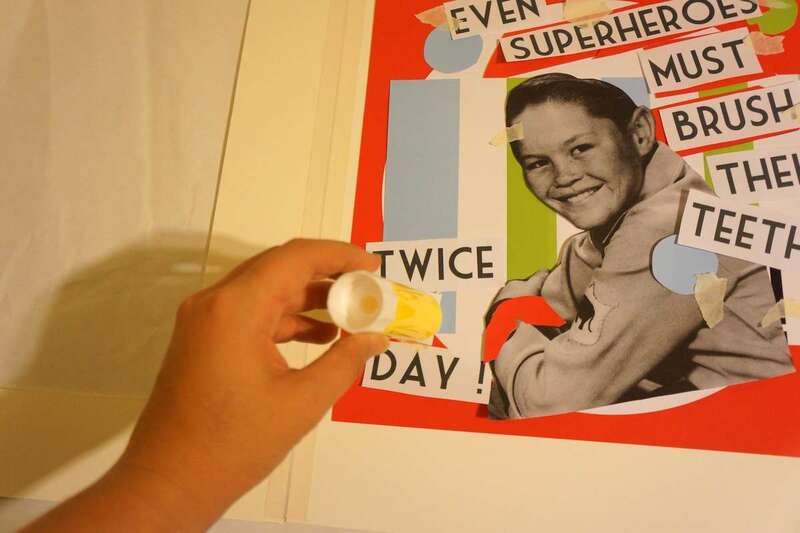 Use masking tape to tack down all your elements very lightly. This will roughly hold the composition in place while you glue and allows you to flip from one corner of each item to apply glue. Now it’s time to glue! 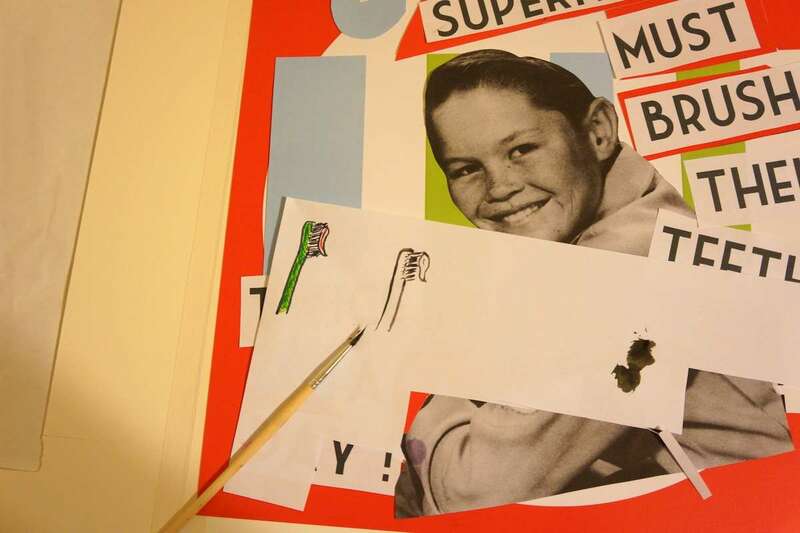 Once everything is secured you can work on the additional “ graffiti” elements of your collage. 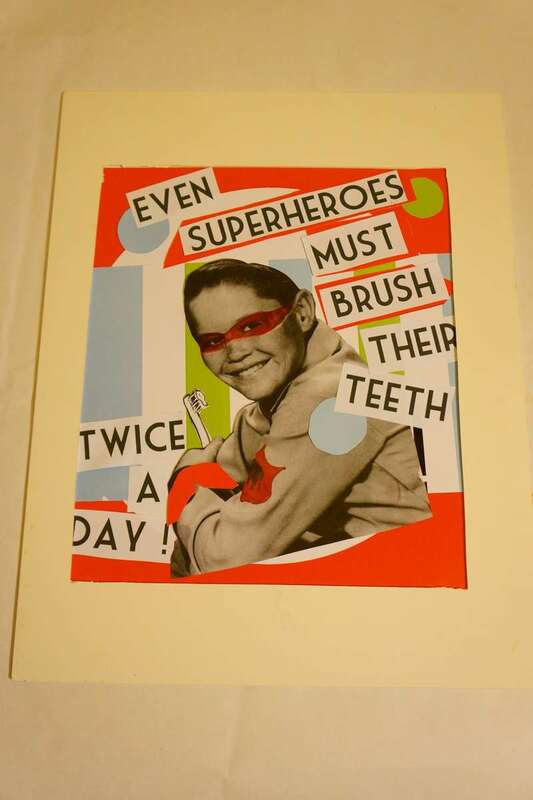 For ours we drew a toothbrush for the boy to hold onto and painted on a superhero mask with watercolours. You could use textas instead. Once all the elements are stuck on and dry, add your frame on top to create a clean finish. And…enjoy! 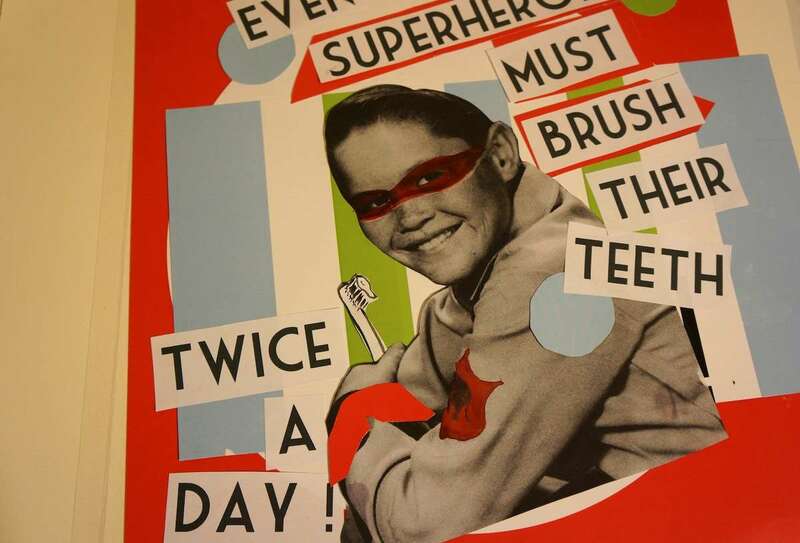 Here’s hoping this popular slogan inspires some tooth-brushing fever in your little bees.